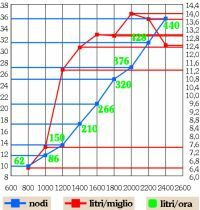 The Avigliana yard, the world leader in the construction of megayachts and of planing yachts - the largest measuring 116 ft long with flying bridge - presented its first open yacht at the last Genoa Boat show. 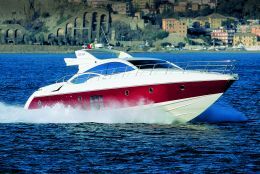 The AZIMUT 68S, designed by the architect Stefano Righini, attracted the attention for her nice slender hull painted an unusual dark red. 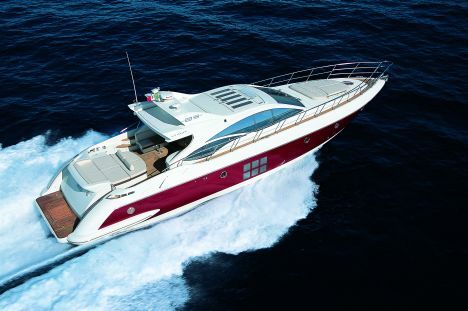 Even though several design particulars, such as the small appendixes of the roll bar and the inverted shark fin-like windows, recall the "family feeling" of the most recent Azimut line, others are distinctly hers. The special square windows that suddenly interrupt the slender surface of the sides, the proportional opening for air intake, the hideaway hard top, are just an example of her special design. 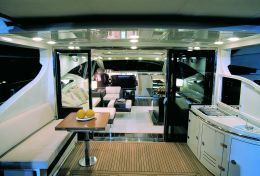 On deck and inside, the innovations are dedicated to increasing the comfort of her future owners and users and suggest that the yacht shall be mainly used in the warm summer days during daytime cruising. 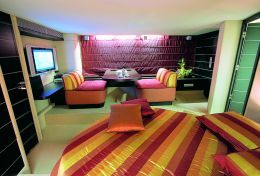 The salon is ample and very bright and is on the main deck in order to "live" the sea and the sun from a 360° angle, nevertheless in case of bad weather it is protected by a hard sliding top, ample windows and the tempered glass bulkhead astern. 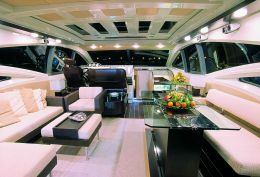 Because of this arrangement, the yacht is not a real open yacht but rather a "coupé" of the sea. 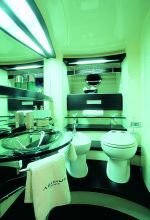 Belowdecks, the staterooms are far from the galley and have separate access to the salon - a special feature hardly found on yachts of this size and which offers total privacy. 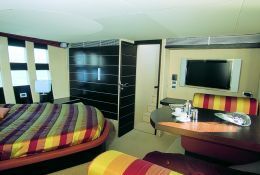 By choosing to use a V-Drive transmission and to fit the engine room astern, the architect could design very ample and comfortable staterooms. 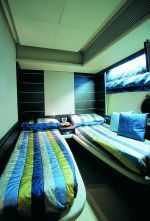 The master stateroom, located amidships and covering the full beam of the yacht, was created for an intimate feeling of the sea, as a matter of fact the waves seem to break on the bed. The architect Carlo Galeazzi created the area belowdecks with a somber décor and highly contrasting hues: clear fabrics and dark wengé wood create an almost severe minimalism in the salon, brightened up by colored silk bed covers and settees in the staterooms. The design of the hull, the quite sleek bow and the balanced distribution of weights allow a good seakeeping ability and, if one does not consider the impacts with the bigger waves, the foam produced is minimal and the rooster tail astern is low and clean. The success and interest obtained by the 68S - nine units sold from mid October till the end of November - certainly show that it is one of the most coveted yachts and it will soon be joined by another new open megayacht, the Azimut 86S, to be presented at the next Düsseldorf Boatshow. Draft from lower tip of propellers: 5'2"
Light boat displacement: 59,471 lbs. ; at half load: 68,291 lbs. Total installed power: 2,300 hp - Total engines and reduction gears weight: 2x4,647 lbs. 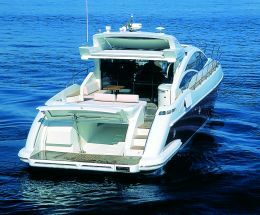 Price with standard equipment and test boat power: Euro 1,500,000 VAT excluded. 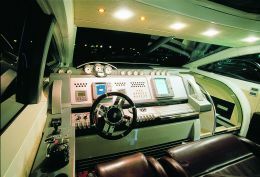 Characteristics of the aft platform: access by way of a small door and two steps to starboard of the cockpit; the platform may be hydraulically lowered with a system of submerged levers, for easy launching of the tender and of the PWC (personal watercraft) stored in the aft garage and accessible through the transom door. The platform is also fitted with an hydraulic stainless steel swimming ladder, two underwater torches, warm and cold water shower and the 11-foot extensible gangway. Galley: separated access, very aseptic and minimalist. It is fitted with a ceramic stove with four hobs, two sinks in the corner, microwave oven and grill, 71-gallon refrigerator, extractor, pantry under the access stairway and the typical Azimut cabinet with drawers for Alessi plates and crockery. Cruising speed at 2,200 rpm's: 31.3 knots. Docking maneuverability: very good. With a simple rotation of the pushbutton of the optional joystick the pilot may control the bow and stern propellers as well as the engines. The maneuver is further facilitated by docking sensors. 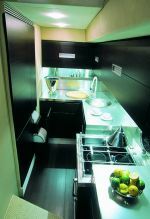 Galley: the idea of keeping the galley separate from the staterooms and salon is excellent; the rational design, the pan holders and the efficient extractor are an indication that the galley is really meant cooking. Bathrooms: comfortable, with ample shower stalls, cabinet and sinks in tempered glass. The drainage system of sewage and wastewater with relative tanks is accurately designed and fitted. Electrical switchboard and plants: low voltage 24V plant with independent generating set for 12V; battery switchboard and fire-fighting control in the cockpit locker; main switchboard with magnetic switches in the engine room for appliances needing both 220V and 24V, the switchboards for each area are in the galley and the individual switches for services are in the helm station dashboard. Optional: air conditioning, master staterooms bathroom bidet, generating sets (from 9 to 17,5 kW), 16 gall/hr water-maker plant, video surveillance system, cockpit teak table, grill-refrigerator-icemaker in the cockpit cabinet, anchor windlass in the cockpit, dishwashing machine, hydro-electrically operated awning for the cockpit, 30" TV set in the salon table and in the master stateroom, 17" TV set in the other staterooms, dimmer switches, multi-voltage transformer for refrigerator.